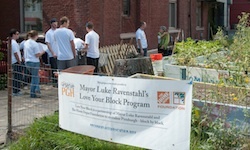 We have a long-standing commitment to our North Side neighborhood community, working to ensure racial justice through activities such as anti-oppression workshops; economic justice through activities such as fair housing advocacy; and community improvement, through activities such as construction and maintenance of community gardens. Most recently we’ve helped Northside Common Ministries construct a new garden area as part of a “Love Your Block” grant that will increase NCM’s capacity to provide fresh food through the food pantry. The church is an institutional member of Central North Side Neighborhood Council and supports its mission that includes sustaining a diverse North Side and advocating for our neighbors’ needs. Our building is often used by a variety of neighborhood groups to provide a public forum. Call the church office at 412-322-4261 for schedule availability.